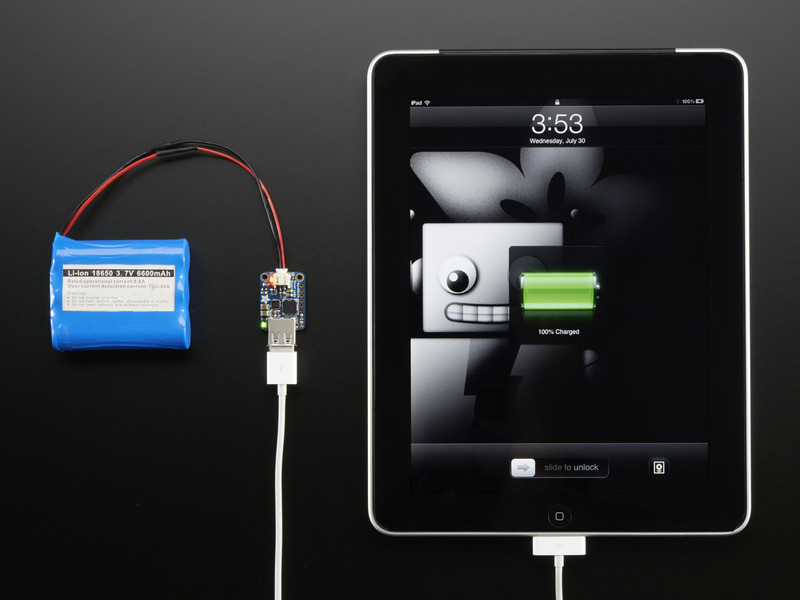 PowerBoost is the perfect power supply for your power-hungry portable project! This little DC/DC boost converter module can run from 1.8V batteries or higher, and convert that voltage to 5.2V DC for running your 5V projects. With a beefy 4A DC/DC converter, it can give you 1A+ from as low as 2V. Like the popular Adafruit 5V 1A USB wall adapter, we tweaked the output to be 5.2V instead of a straight-up 5.0V so that there's a little bit of 'headroom' long cables, high draw, the addition of a diode on the output if you wish, etc. 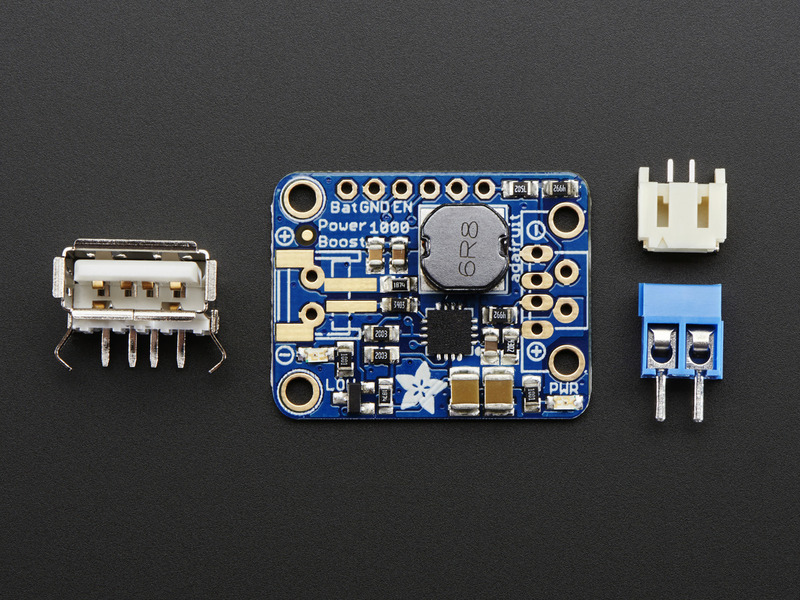 The 5.2V is safe for all 5V-powered electronics like Arduino, Raspberry Pi, or Beagle Bone while preventing icky brown-outs during high current draw because of USB cable resistance. 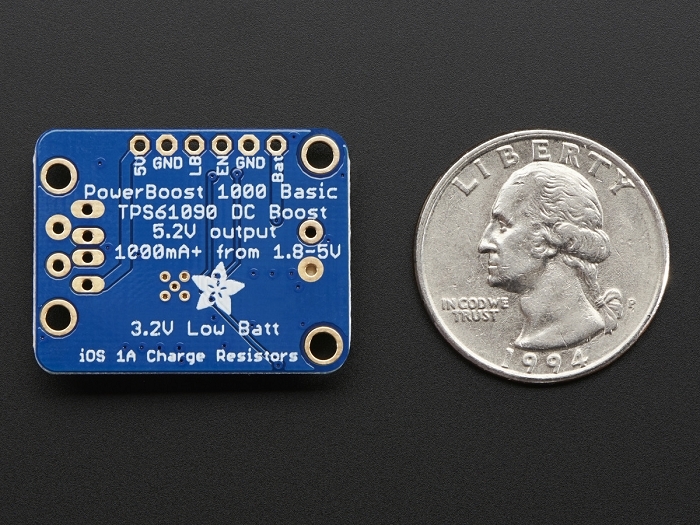 The PowerBoost 1000 has at the heart a TPS61030 boost converter from TI. This boost converter chip has some really nice extras such as low battery detection, 4A internal switch, synchronous conversion, excellent efficiency, and 700KHz high-frequency operation. Check out these specs! 4A internal switch means you can get 1000mA+ from as low as 1.8V, 1500mA+ from 2 NiMH or Alkaline batteries, and at least 2000mA from a 3.7V LiPoly/LiIon battery or 3 NiMH/Alkalines. Just make sure your batteries can actually supply the required 2-4A, OK? On-board 1000mA charge-rate 'Apple/iOS' data resistors. Solder in the included USB connector and you can plug in any iPhone or iPod for a speedy 1000mA charge rate. Works with iPads, both mini and 'classic' type. Great for powering your robot, Arduino project, single-board-computer such as Raspberry Pi or BeagleBone! Each order comes with one fully assembled and tested PCB, a loose 2-PH JST jack, a 2-pin Terminal block and a loose USB A jack. 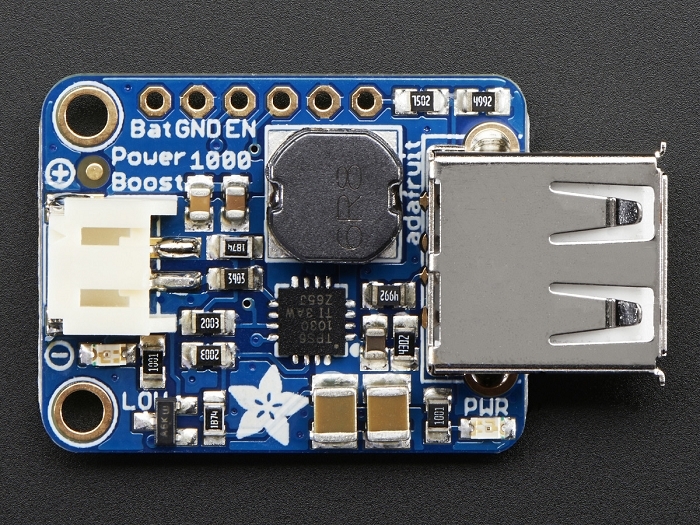 If you are powering your project from USB, solder the USB A jack in (a 3-minute soldering task). Then choose either JST for input (JST is often used for our LiIon batteries, but the connector is only rated for 2A) or a terminal block. The 1000 version comes with a 2-pin terminal block so you can solder it to the output spot where the USB jack would go. Or don't solder any connectors in for a more compact power pack and go with 22AWG wires soldered directly in.